Er… so I’ve only gone and won a place for Nike+ Run to the Beat haven’t I! Slight problem in that it’s 4 BLOODY WEEKS tomorrow!! That means I’ve got exactly 28 days to get from a ploddy 10k to a relatively pain-free 13.1 miles. 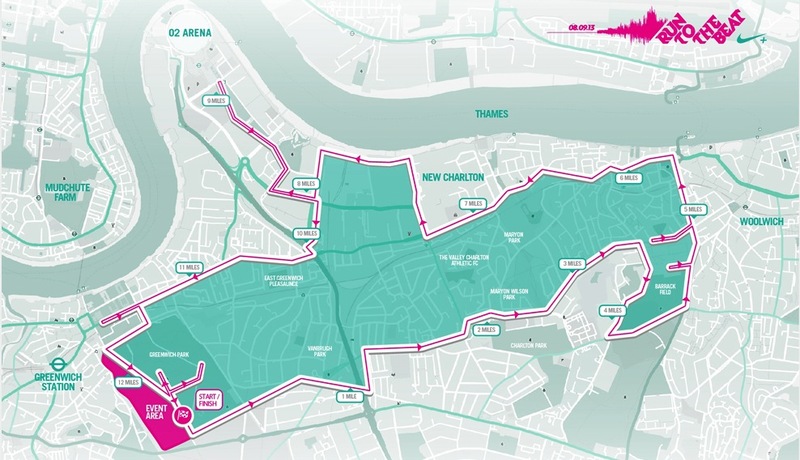 Anyway, for those of you not in the know, Run to the Beat is London’s biggest and most unique half marathon, with music stages and live DJs ‘pumping out motivational tunes’ along the 13.1 mile course that starts and ends at Greenwich Park. I’m interested to see what they deem as ‘motivational tunes’ as I already know what I like to run to. At the end of the race there’s apparently a ‘euphoric set’ from the headline act to look forward to – so it sounds wicked, and obviously much more fun than your average half marathon race. I’m hoping the music and atmosphere will carry me through last couple of miles when the heavy legs set in. Seeing as I’ve only got 4 weeks, my goal for the next month is all about time on feet rather than worrying about pace and times. Chasing my 25-minute Parkrun will have to wait. I just wanna finish this alive. I’m gonna have to build up the miles again sensibly and swap my bootcamp sessions to get used to running 4-5 times a week, throwing in some hills, speed work, long runs and strength training to be as ready as I can for race day. Hopefully the month’s supply of Vita Coco coconut water that comes with my free entry will help with training. Oh, and just to make it that bit easier, me and the boy are doing a camping road trip round the Scottish Highlands for a week next Saturday, slap bang in the middle of training. Although, we will be doing lots of walking (up Ben Nevis on one of the days), and I’ve scheduled some runs in for that week once we set up camp in the different areas. The boy can chill with his book at the campsite while I go and find a nice big hill to run up. last night, and dug out the running magazines for tips, and have drawn up a plan based on a combination of what I found. race experience in the world. 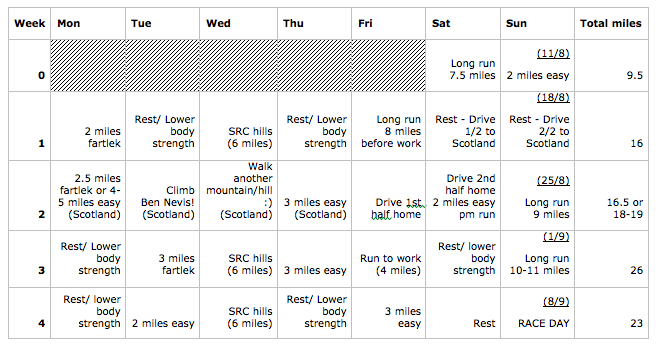 Here’s my training plan, working around our Scotland holiday. Not sure if it’s too much, but I workout 4-5 times a week anyway with bootcamp classes so it’s not like I’m starting from nothing. First run done this morning, 7.5 miles along my favourite route – Brighton’s undercliff path, from the Big Wheel to Rottingdean and back. Last week I did from the Big Wheel to Rottingdean and only back to the Marina, so going all the way back added another mile on, and it wasn’t too unbearable. What do you reckon, am I being stupid? Any tips to get me race-ready in 28 days? HELP!! Previous Post Trying to be a better runner – my essential kit list.